We are a leading Manufacturer of automatic sliding doors and sliding glass doors from Pune, India. 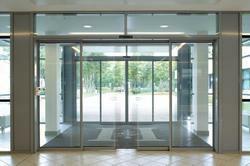 We are the prominent provider of the broad assortment of Automatic Sliding Doors. Automatic sliding, and swing doors are the necessity of malls, hotels, corporate office & airports. They are convenient, useful to maintain the internal air-conditioned. These are convenient and useful in maintaining the internal air conditioning and saving energy. Looking for Automatic Sliding Doors ?